When Tillie Anderson came to America, all she had was a needle. So she got herself a job in a tailor shop and waited for a dream to find her. One day, a man sped by on a bicycle. 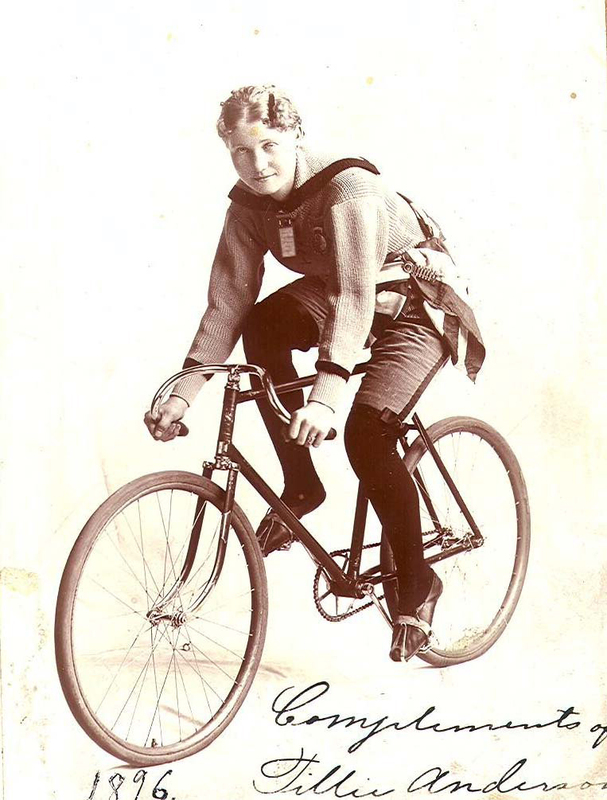 She was told “bicycles aren’t for ladies,” but from then on, Tillie dreamed of riding—not graceful figure eights, but speedy, scorching, racy riding! And she knew that couldn’t be done in a fancy lady’s dress… With arduous training and her (shocking!) new clothes, Tillie became the women’s bicycle-riding champion of the world. Sue Stauffacher’s lively text and Sarah McMenemy’s charming illustrations capture the energy of America’s bicycle craze and tell the story of one woman who wouldn’t let society’s expectations stop her from achieving her dream. For one week in May 2011 (5/16-5/20), children’s book author Sue Stauffacher–accompanied by her husband, experienced cyclist Bob Johnson, media gal Sara Schneider, and various groups of schoolchildren along the way–rode from Grand Rapids, Michigan, to Chicago, Illinois (254 miles), to deliver donated copies of her recently released picture book, Tillie the Terrible Swede (Knopf, January 2011) to the Chicago Public Library. 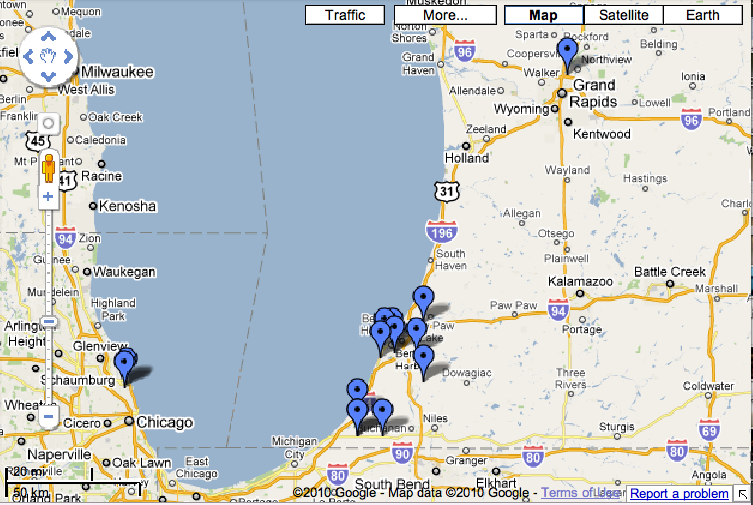 In Chicago, they stopped at the Swedish American History Museum and the Sulzer branch of the library. 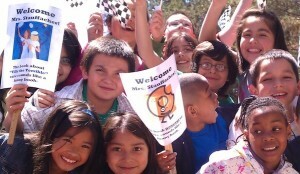 Along the way, they visited schools that have not had a children’s book author visit within the last five years. Sue would like to thank the following talented team for making the above video possible. Alyson-Caillaud Jones and Suzanne Zack for capturing footage; Bob Hazen and Thom Bell for filming the interviews; Jordan Peasley and Michael Johnson for editing the film; Alice Olson Roepke and Terry Roepke for use of archival photographs; Bob Johnson, Sam Johnson and Roger Gilles for technical assistance; and Sara Schneider for social media. Thank you all so much! Want to learn more about this adventure? Please visit The Tillie Ride website to see the lessons Sue used to help herself train for a 250+ mile bike ride in honor of the publication of Tillie’s book. In particular, kids will learn about resiliency and fortitude in this section. 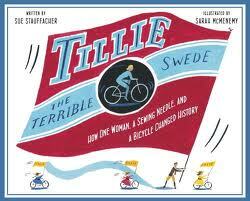 Sue brought Tillie the Terrible Swede on the road to hundreds of youth throughout Michigan, Indiana, and Illinois...on her bicycle! Read more about The Tillie Ride!